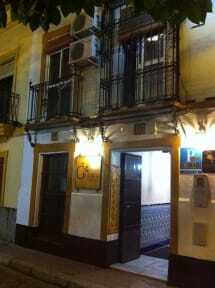 The Hostal Giraldilla is located in a historic building, in one of the most famous streets of Seville. Situated in the heart of Seville, on the street Gravina. Hostal Giraldilla has a great location that allows you to explore, on foot, the charm and beauty hidden in the corners of this ancient town. Giraldilla offers basic rooms with bathroom, satellite TV, room service,free WiFI. and so on. Giraldilla has rooms with private bathroom inside the room and rooms with private bathroom on the corridor.All the bathrooms are privates. All our rooms have heating and air conditioning on request. -Bus Station Plaza de Armas: This bus station is located very close to our property, around 3 minutes walking.You can take a bus from this station if you want to explore Granada, Cordoba, Malaga , Huelva ,Cadiz or Jerez. 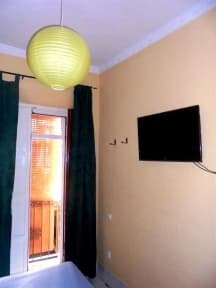 Property located in the heart of Seville. FREE WiFi Internet 24 hours. Towels, soaps and bath gels, plus a full cleaning of the rooms every day. Sale of tickets for the best flamenco shows and tourist bus. Young but experienced staff will attend you in any matter. Hot showers 24h,fresh linen included. Free hot drinks are available all day. Check out time until 11:30 a.m.
Clean, room and bathroom with air-con. Staff were friendly and happy to answer any questions I had. Central location within short-walking distance to tourist attractions but the hostel itself was still quiet. Stuff was very polite and helpful with lot of recommendations for bunch of restaurants and cool places to visit. We arrived early in the morning, though that was not the problem to leave our baggage and rest a bit before we've continued Seville sightseeing. Room was very clean.Hostel interior is very interesting. Location is great, almost in old town city center, only 8 minutes from Cathedral. It was small but comfy and very clean. Staff very friendly desk was always maned. It was fairly close to the centre. The bed was comfy and bedding was comfy and fresh. We stayed in a private triple. The bed was on the soft side. We did not need to use the heating or AC as the windows allowed plenty of air. Or room was on the 3rd floor. That meant climbing 3 sets of very narrow stairs. The historic building was very cute, but narrow. Our only real complaint was the teeny, tiny shower. With a 2x2 ft footprint, it did not allow much space to turn around without accidentally bumping the control and scalding or freezing yourself. Overall, I'd recommend this place. Friendly staff, room was clean but basic. Great price for the location but really noisy so bring earplugs! Perfect for whatever needed. Great location, comfortable and spotless. We stayed in a private room here. The location was excellent, the hostel was kept very clean every day, and the beds were extremely comfy. A few downsides: the staff didn't speak much English so we couldn't communicate with reception. Bring some ear plugs as the hostel can be slightly noisy at night (as with all hostels). Overall a wonderful stay and definitely one of the best value options in Seville. Room on the fist floor facing the street was very noisy from street noise and traffic. Cars and motorcycles passing by only few feet from our bed. Room was tiny and very hot in the summer. There is an air-conditioning, at additional charge of 5 Euros per day. Our TV stopped working after first day, I guess we didn't feed the meter (maybe another 5 Euros per day?) With tiny room comes a tiny bathroom. Hostel is close to the main bus terminal and bars on the windows provide sense of security.